Brandi Nell the Southern Belle: I'm BACK... well tomorrow I will be. HI! I am finally back in Blogland after a brief hiatus. We have been working on the MAJA project of the office cabinets for the past two weeks - and we just finished TONIGHT. HUZZAH! 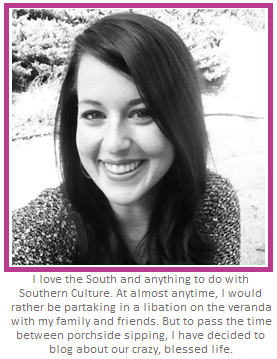 Check back tomorrow for the post. 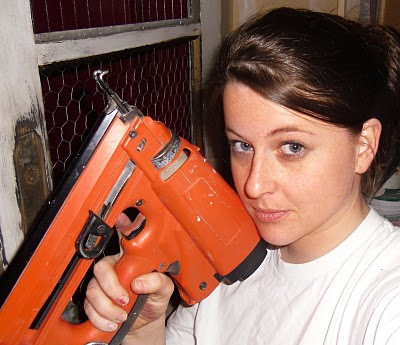 For now, I leave you something to giggle at... me with a nail gun. Scary right? Not sure what's more scary: me with a nail gun, the makeup underneath my eyes, or that WEIRD face I am making, or the fact that I am freely sharing it with the world. So tired... heading to bed. Talk soon (as in tomorrow), friends! Thanks for staying with me, my loyal followers!